Surely Google’s Android Operating System has recorded much fame, with one after the other release of updates, fixes, features and the ever growing Android Marketplace. Android has been able to attract thousands of developers, submitting number of applications to the Android Market, marking its expansion and making it stronger. Recent stats have revealed that the Android Market has been able to register over 200,000 apps. Even though the Android Market is not as stuffed as the Apple App Store which facilitates iPhone, iPod and iPad users, recording over 300,000 apps, the Android Market seems to be accelerating super fast. A few months back we reported on the Android Market celebrating the Apps count to 100,000. 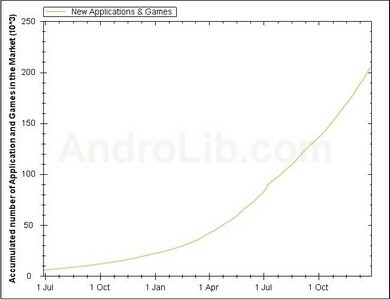 AndroLib, a pure Android related website bringing in reviews, downloads and stats on Android products, displayed via a graph, the total number of apps and games available for download via the software portal. Another thing which you would find over the website is the ticker which displays the number of downloads, growing pretty fast, averaging over 105 downloads per second. While AndroLib reported on the figures, no official word was available by Google on the actual numbers of downloads or total apps and games available on the Android Market.